The Bell witch cave is as famous as it is today because of the Legend of the Bell witch, but the cave itself shows signs of being used long before this story came about. The cave is directly below the site of an ancient Indian burial ground and the cave itself holds a rather unusual grave. 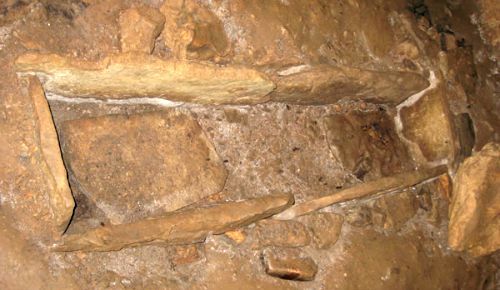 The picture below is a stone grave that was built into the floor of the cave many years ago, but the reason for this is unknown, as normally Indian burial grounds were built into the earth like normal graves, which had a lot to do with their beliefs of being returned to the earth upon death. The first documented finding of the grave claims that it was empty, thought to have been plundered years before the area was colonized by the Europeans, though why they also took the body shall forever remain a mystery. As for the the bell witch the story starts with John Bell, who moved to Robertson County with his family in 1804. The cave was included in their 304 acres of farm land they purchased along the red river. The family lived peacefully on their property and became prosperous and well liked by the locals, with John becoming a deacon of the local church, But all this would change in the year 1817. During that year the family started to see strange animals around their house and soon after this started unexplainable noises started within the house itself. The family would hear noises such as animals gnawing at the woodwork and chains being dragged across the wooden floors, always after dark, though there was never any evidence found of these sounds. This would only get worse over the next year with the sounds becoming more frequent and started to include knocking at the outer walls and the sounds of things being thrown across the room, again always after dark and also leaving no evidence that something was actually thrown, just the noise. These strange noises soon started to scare the family so much that they confided in their neibour, James Johnson, who was invited to stay in the house overnight with his wife to witness it for themselves. The sounds were heard quite clearly by the Johnsons and after this the house became somewhat of an attraction, with people coming from miles away to witness the noises and even a committee was formed to try and identify the cause of the sounds. The force behind the strange sounds grew and it wasn't before long that it actually developed a voice and responded to the people in the house. On one such occasion when asked who it was the voice responded her name was Kate, and this is supposedly the reason the Bell Witch is today known by that name. Kate once gave a terrifying reason for her presence at the house, which was to kill John Bell and to stop John's youngest daughter Betsy from marrying a neighbor boy named Joshua Gardner, though she never gave a reason for wanting these things. On December 20th,1820 John Bell died after a long unidentifiable illness, and the next year his daughter broke off her engagement with Joshua Gardner, of which Kate took full credit for. After her "mission" was accomplished she claimed she would be back in 7 years, and surely in 1828 she returned to the house, now owned by John Jr.
She had many long conversations with the John Jr about the past and future and again promised to be absent, only to return in 107 years, which would have been 1935, though there were many strange occurrence in the area during those 107 years, making many believe she never actually left. The story of the bell witch has become part of Tennessee legend and is even taught in some school in the state to this day. Is the Bell Witch Cave Haunted? The strange things that happened during the time of the Bell family is thought to still be happening today, though on a much more infrequent level. 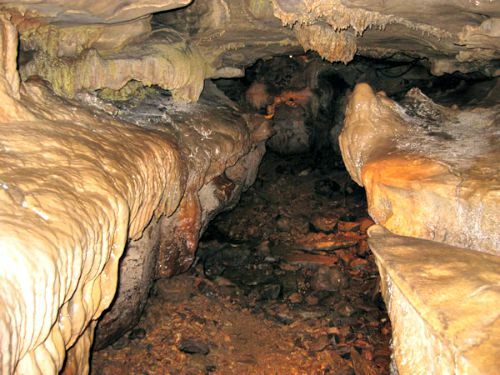 The cave is privately owned but does hold tours throughout the summer, and many people who have been on these tours have claimed to have seen signs of Kate, with claims ranging from her directly speaking to them to being actually attacked by her, with scratches and hair pulling being the most common. The amount of stories from the cave are simply huge, with pretty much everything you can imagine, but whether or not this is just a camp fire story being blown out of proportion of is the cave is indeed haunted by the spirit of, something, can only be decided by the people who have gone there.